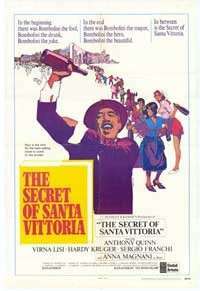 The Secret of Santa Vittoria is a 1969 film distributed by United Artists. It was produced and directed by Stanley Kramer and co-produced by George Glass from a screenplay by Ben Maddow and William Rose. It was based on the best-selling novel by Robert Crichton. The music score was by Ernest Gold and the cinematography by Giuseppe Rotunno. The film stars Anthony Quinn, Anna Magnani, Virna Lisi, Hardy Krüger, and Sergio Franchi. It also features Renato Rascel, Giancarlo Giannini, and Eduardo Ciannelli; with Valentina Cortese making an uncredited appearance. It was almost entirely shot on location in Anticoli Corrado, Italy (near Rome). The world premiere was held in Los Angeles, USA on October 20, 1969. Television coverage included a special split-screen selection during The Joey Bishop Show. Army Archerd, Regis Philbin and Buddy Hackett interviewed Stanley Kramer, Anthony Quinn, Virna Lisi, and Sergio Franchi from Los Angeles. The premiere was held to benefit the Reiss-Davis Child Study Center, with Gregory Peck as chairman. The event ended with a celebration at the Century Plaza Hotel. This was selected as the opening-night film for the 13th Annual San Francisco International Film Festival. The festival ran from October 23, 1969 until November 2, 1969. During World War II in the summer of 1943, in the aftermath of the fall of the Fascist government of Benito Mussolini, the German army uses the ensuing political vacuum to occupy most of the peninsula of Italy. Italo Bombolini (Anthony Quinn), the mayor of the winemaking hill town of Santa Vittoria, learns that the German occupation forces want to take all of Santa Vittoria's wine with them. The townspeople frantically hide a million bottles in a cave before the arrival of a German army detachment under the command of Sepp von Prum (Hardy Krüger). The Germans are given a few thousand bottles, but von Prum knows there is a lot more. The two very different men engage in a battle of wits. Finally, with time running out, a frustrated von Prum threatens to shoot Bombolini unless the hidden wine is given up, but no one speaks. Not being a fanatic, von Prum leaves without harming the mayor. The film earned $6.5 million worldwide, which was considered a disappointment considering the popularity of the novel. The film was nominated for two Academy Awards for Film Editing (William A. Lyon and Earle Herdan) and Best Music Score (Ernest Gold). It was nominated for an Eddie award by the American Cinema Editors, USA for best edited feature film. The Secret of Santa Vittoria was shown on April 30, 2015 on Turner Classic Movies as part of its "Star of the Month salute" to Anthony Quinn. ↑ "Secret Premier to Benefit Study Center." (September 13, 1969) Los Angeles Times, Los Angeles, CA. Wikimedia Commons has media related to The Secret of Santa Vittoria.